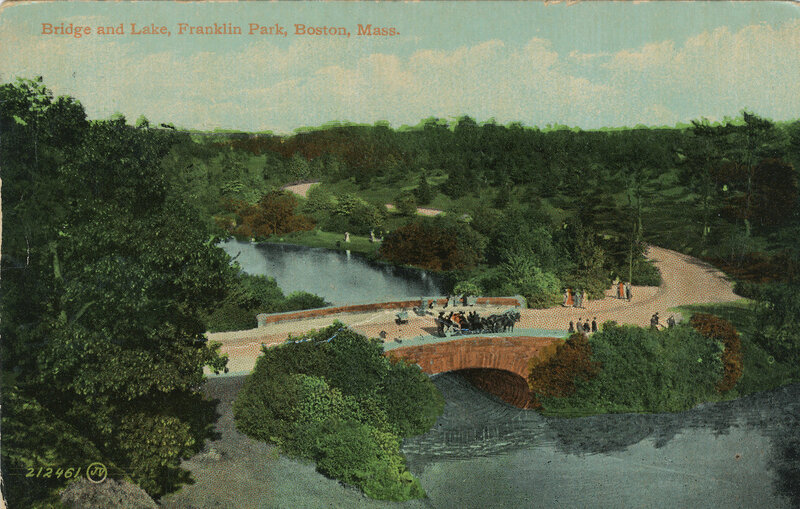 A while ago I bought this old postcard of Franklin Park at a flea market. I loved the layout, it’s a rare card with two images! The top shows the Carriage Bridge over Scarboro Pond, near the Rock Morton (or is it the Rock Milton?). 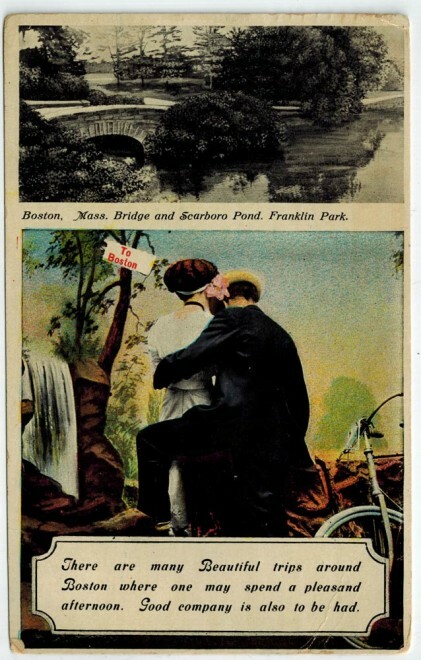 The bottom image shows a romantic moment between a bicycling couple, who appear to be near some sort of waterfall. There are no waterfalls in Franklin Park. 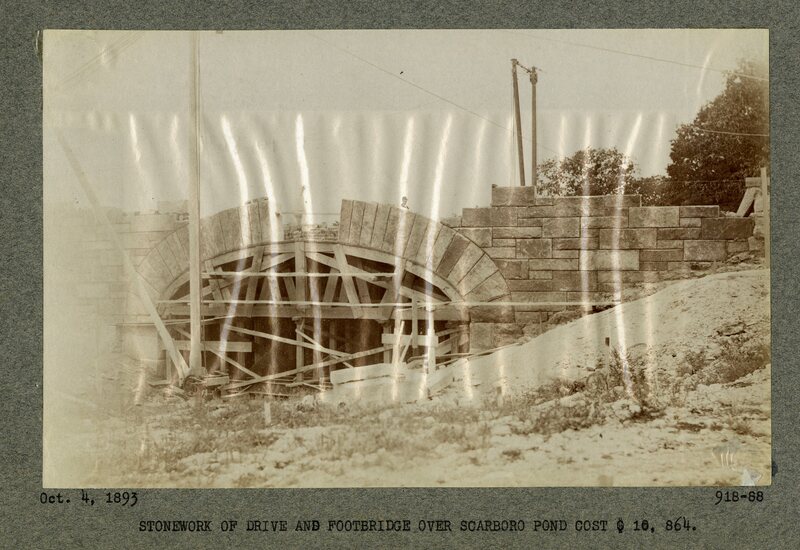 As a history and photography nerd, I was immediately interested in the image of the Carriage Bridge. 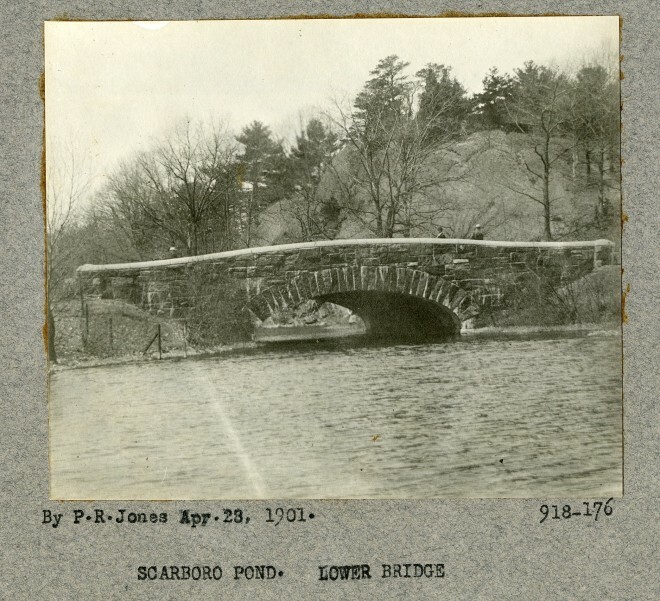 Which, if you’ve ever googled the Park, is probably confusing… why care about this image? It’s the most common postcard of the Park! There are dozens of variations of the Carriage Bridge photographed from atop the Rock Morton, from summer, winter, spring, fall… you’d think the only attraction in the whole Park is this one bridge. Here’s a link to a panorama I took from atop the Rock Morton with one of the many, many postcard variations overlaid. 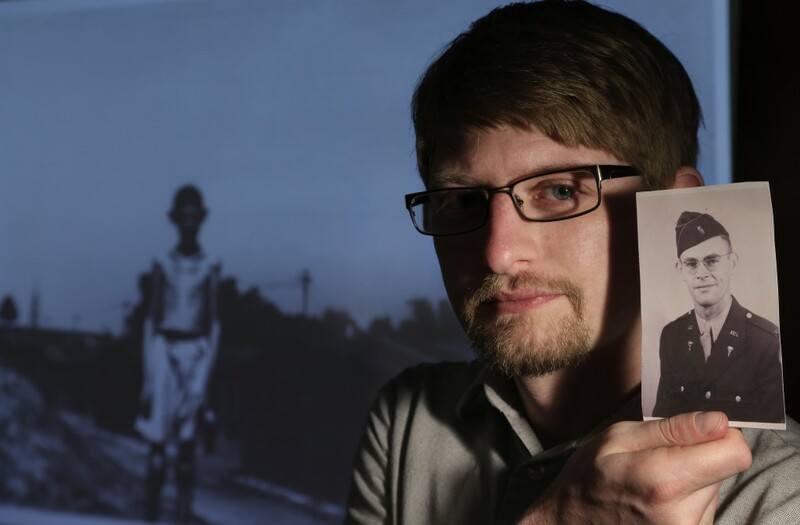 So, why do I care about this tiny image on a postcard? Well, it’s because it’s not taken from atop Rock Morton. The angle is wrong — the roadway is viewed from the side, not above. There’s no view of the Refectory building in the background, and no chunk of the Rock Morton visible in the bottom-left corner. These are hallmarks of every postcard image, summer or winter, taken from the top of the rock. Standard postcard view from atop Rock Morton. 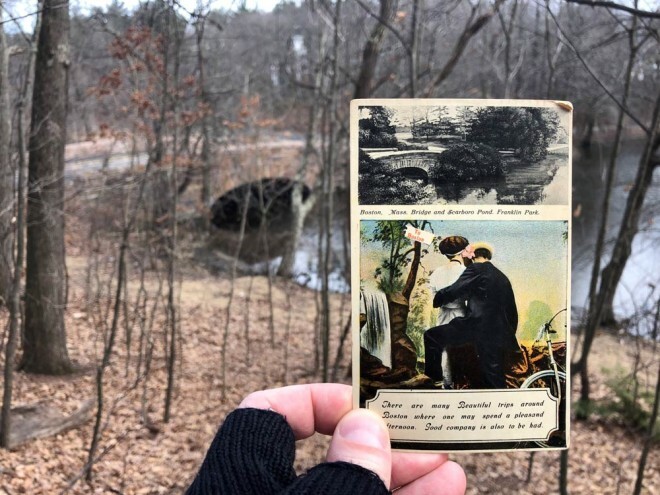 Today I had time to wander over and compare the photo to reality, and it took a few minutes wandering in the woods to find where it was taken. 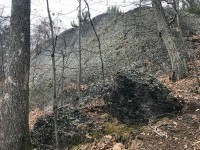 The Park staff have been making a lot of improvements in the area, so I had to navigate fresh fertilizer, construction stuff and the messy wooded slopes of the hill… but eventually I found an area that showed the view I was looking for. 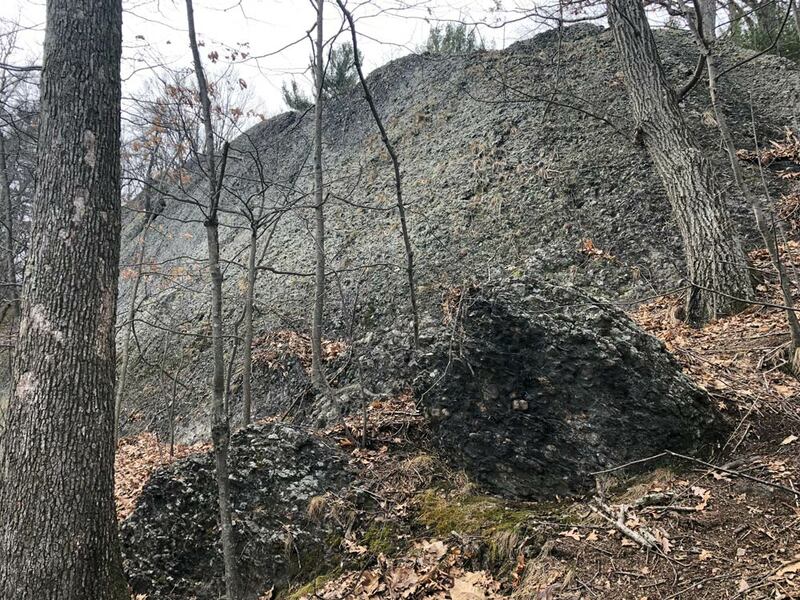 Pushing through the leafless trees, I eventually got to a spot on the side of the hill, just below the steep 92-foot face of Rock Morton, on which the photographer must have set up his camera. There is a small rock outcropping where, thinking like a lazy photographer carrying a big 8×10″ camera, I could see why he chose the spot. Looking up at the Rock Morton, with the rock outcropping where our lazy photographer stood. Thus, I spent a very happy part of my Sunday tracing the steps of a lazy 19th century photographer. At least the bicycle couple and I got some exercise! The Carriage Bridge with the postcard, to compare views. The images below are all from the Olmsted Archives & Boston Public Library‘s Fickr pages. View of the Carriage Bridge under construction in 1893. View of the Carriage Bridge, looking west with the Rock Morton in the background. 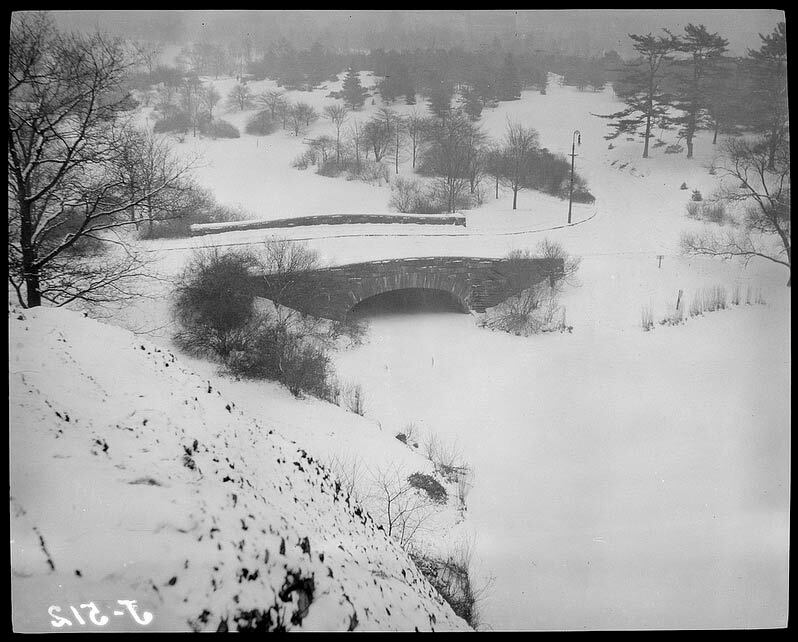 Non-lazy photographer Leslie Jones took this one from atop the rock in 1918. Finally, here’s a panoramic image of the Rock Morton, looking up from the Carriage Bridge that I took today. As bleak as it is, once the leaves are on the trees the views disappear! Rock Morton panorama from the Carriage Bridge.